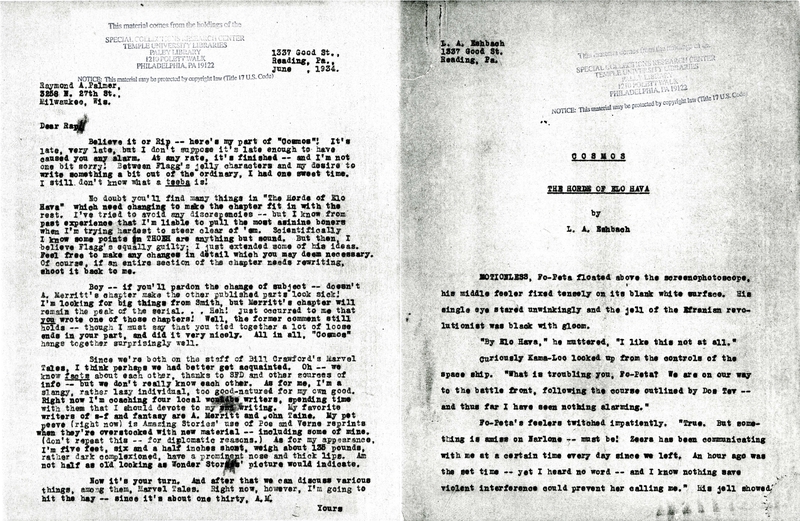 The interactions between the young editors of Science Fiction Digest / Fantasy Magazine and the contributing authors of Cosmos went far beyond their collaboration on the novel itself. In many cases they were involved in a variety of publishing and writing projects, and also formed friendships. 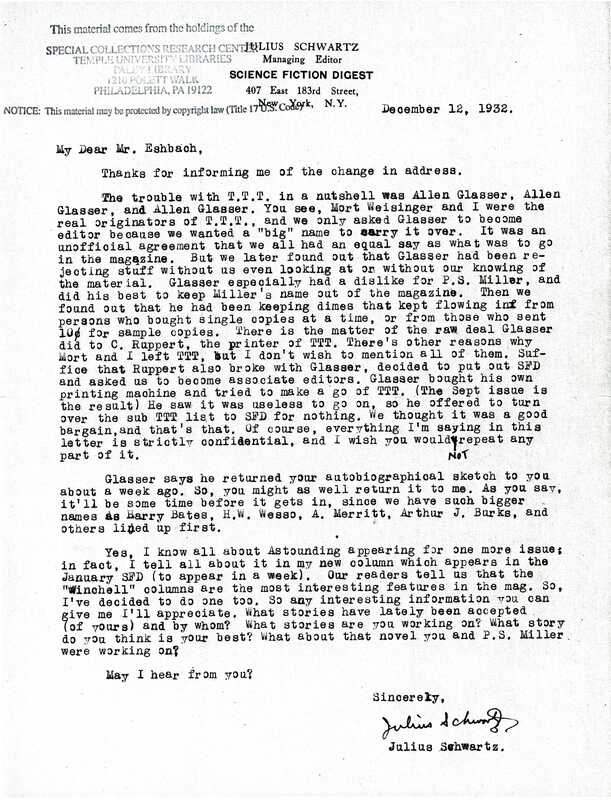 The Scienceers was one of the original science fiction fan clubs, formed in December, 1929 in the New York area. From its members sprang many of the most influential figures in SF and the first real fan publication, The Planet, with the first issue appearing in June, 1930. The editor of The Planet was Allen Glasser. In January of 1932, Glasser worked with fellow Scienceers Schwartz and Mort Weisinger to found The Time Traveler, by far the most sophisticated fan magazine at the time. After a falling out with Glasser, this same group started Science Fiction Digest later that same year and published the first issue in September, 1932. 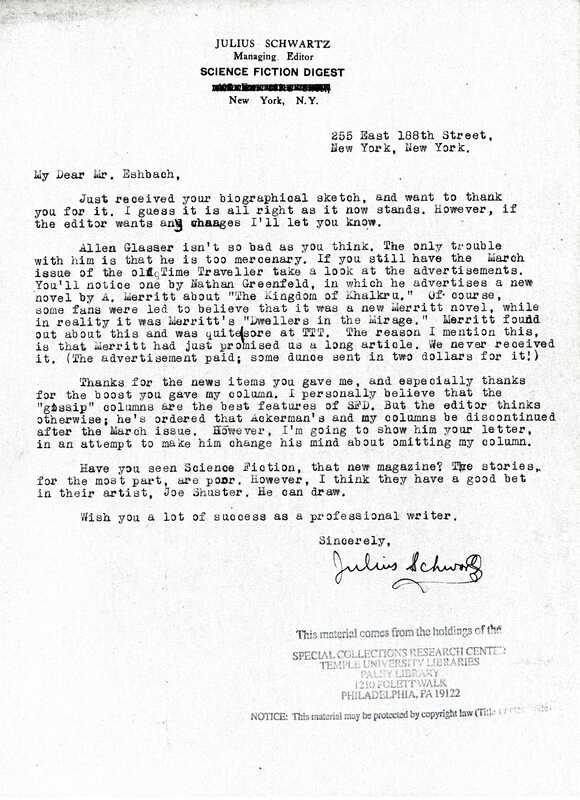 This early letter from Schwartz is undated, but it’s approximate origin is suggested in a March 19, 1932 letter to Eshbach, apparently in response to an Eshbach missive sent to The Time Traveler commenting on a column in the magazine. 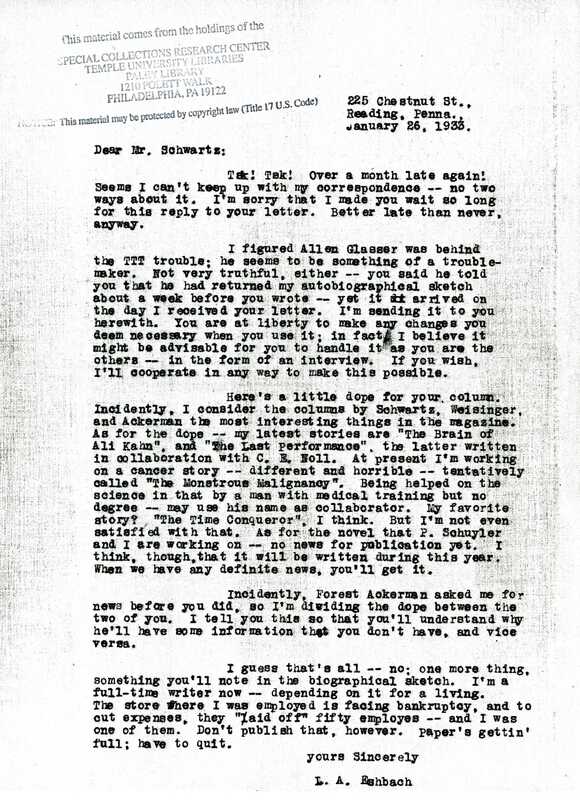 Here Schwartz says, “Perhaps you will remember that about a year ago, I sent you a letter asking for a biography of yourself…” We can see how the editors collected the tidbits of science fiction gossip that were the staples of their magazine. Through a steady stream of correspondence, patiently tapped out and sent by post, the social media of these days managed to connect a rapidly growing fan community with the information it craved. 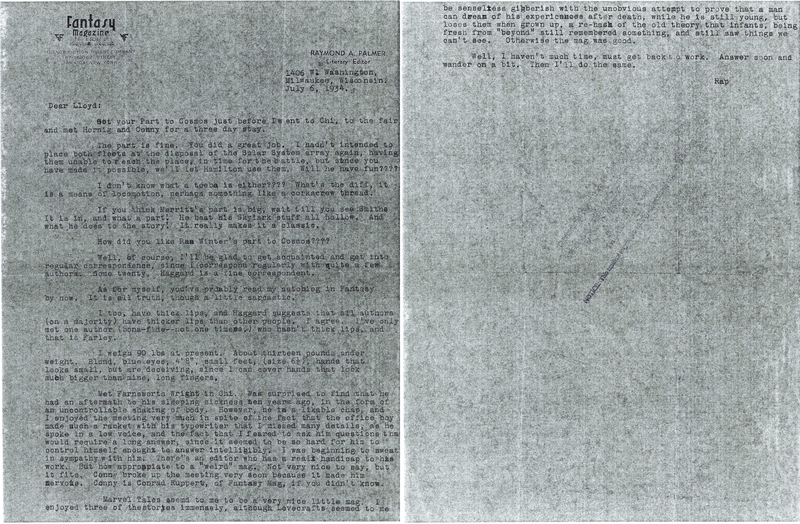 The exchange of letters continued over the following months, with Schwartz sharing the story of how The Time Traveler group separated from Glasser to start SFD. The “other reasons Mort and I left TTT” mentioned here include Glasser plagiarizing a story that had been previously published by another author and submitting it under his own name to Amazing Stories. 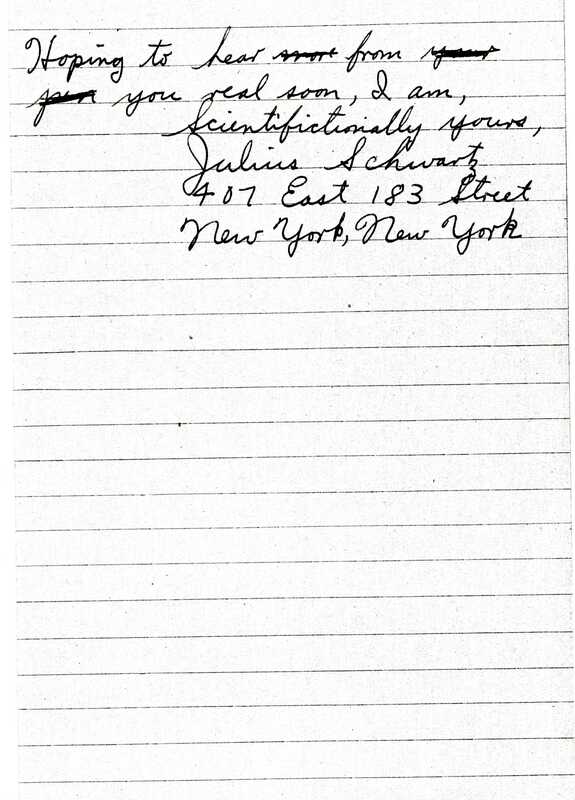 Eshbach answered in January of 1933 and provided some additional news for Schwartz’s column. 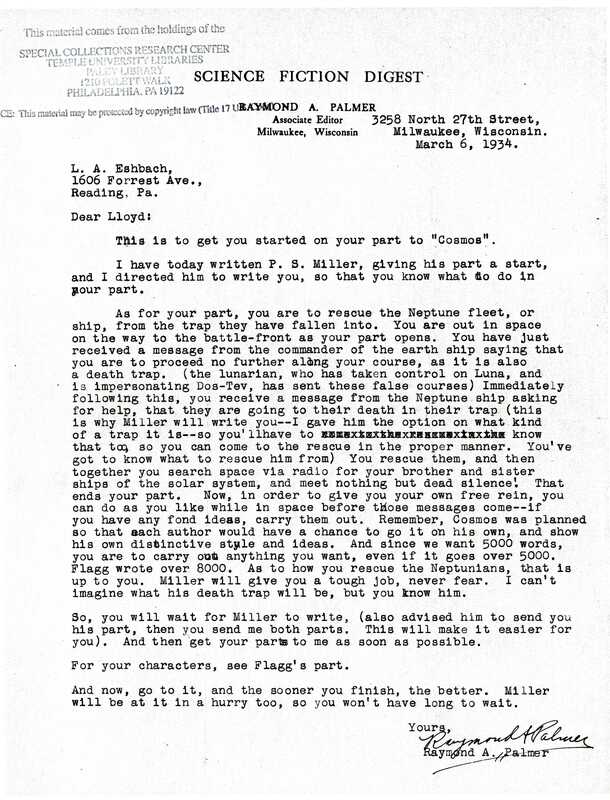 His comment that “Forest Ackerman asked me for news before you did, so I’m dividing the dope between the two of you,” shows that the editors weren’t always coordinated in how they communicated with their sources – they were actually competing for scoops. Echbach’s letter ends with a reminder that all of this is happening in the midst of the Depression. Fortunately for science fiction fans, Eshbach’s loss of employment was their gain. Schwartz’s reply highlights an ongoing debate among the editors: how much gossip should they publish, versus focusing on fiction? Although SFD aspired to be more of a fiction magazine, the readership appreciated the inside stories and reviews, and looked to the professional pulps for fiction. SFD couldn’t compete on quality for stories since it couldn’t afford to pay the authors… and in the heat of this argument, in early 1933 the idea for Cosmos was born. With Cosmos, the editors hoped to attract the involvement of top writers at no cost, lifting the prominence of both the magazine and its staff. Although Cosmos may not have achieved literary success, the future careers of its editors attest to the longer -term impact of the gambit. 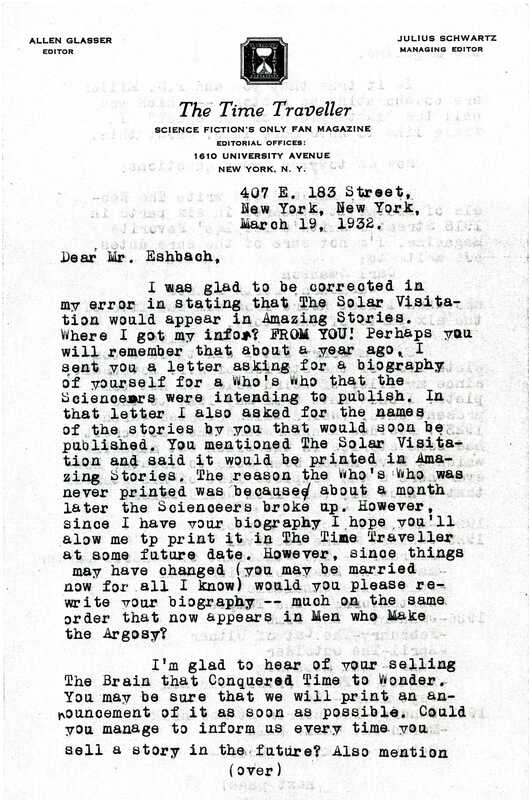 Eshbach’s response came in June, with an accompanying letter and his manuscript for his chapter, “The Horde of Elo Hava,” which would appear as Chapter Fifteen of Cosmos in the September, 1934 issue of Fantasy Magazine. 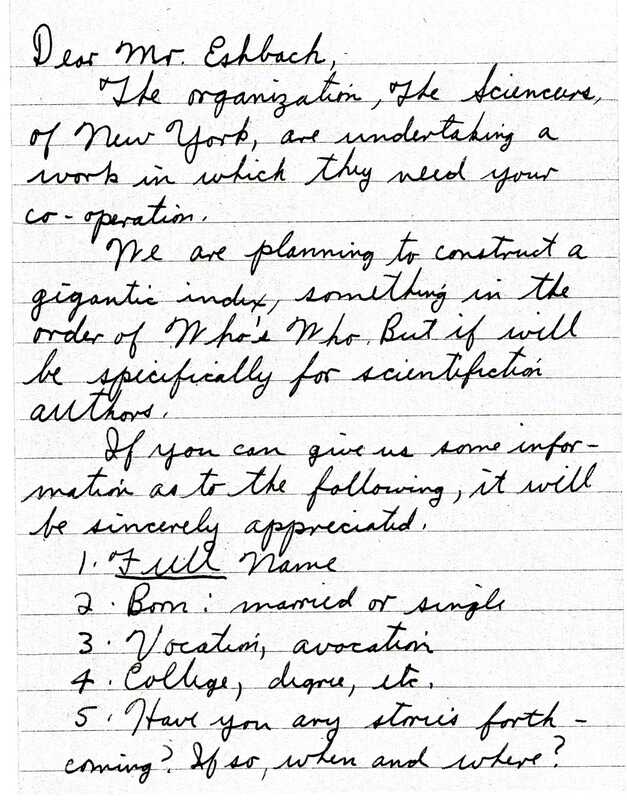 Palmer accepted Eshbach’s chapter in a letter dated July 6, 1934. Interestingly, he queries, “How did you like Rae Winter’s part to Cosmos??? ?” – which of course Palmer had written himself under that pseudonym. Rap had also shamelessly praised “Rae” in his December 1933 column accompanying the chapter. Insecurity? Passion for self promotion? Probably some of both. As for his commentary on the thick lips of all “bona fide” authors… I’ve got nothing. Got your part to Cosmos just before I went to Chi, to the fair and met Hornig and Conny for a three day stay. The part is fine. You did a great job. I hadn’t intended to place both fleets at the disposal of the Solar System array again, having them unable to reach the place in time for the battle, but since you have made is possible, we’ll let Hamilton use them. Will he have fun???? I don’t know what a teeba is either???? What’s the diff, it is a means of locomotion, perhaps something like a corkscrew thread. If you think Merritt’s part is big, wait till you see Smiths. It is in, and what a part! He beat his Skylark stuff all hollow. And what he does to the story! It really makes it a classic. How did you like Rae Winter’s part to Cosmos???? Well, of course, I’ll be glad to get acquainted and get into regular correspondence, since I correspond regularly with quite a few authors. Some twenty. Haggard is a fine correspondent. As for myself, you’ve probably read my autobiog in Fantasy by now. Is is all truth, though a little sarcastic. I too, have thick lips, and Haggard suggests that all authors (on a majority) have thicker lips than other people. I agree. I’ve only met one author (bona fide – not one timers) who hasn’t thick lips, and that is Farley. I weigh 90 lbs at present. About thirteen pounds under weight. Blond, blue eyes, 4’8″, small feet, (size 6 1/2), hands that looks small, but are deceiving, since I can cover hands that look much bigger than mine, long fingers. Met Farnsworth Wright in Chi. Was surprised to find that he had an aftermath to his sleeping sickness ten years ago, in the form of an uncontrollable shaking of body. However, he is a likable chap, and I enjoyed the meeting very much in spite of the fact that the office boy made such a racket with his typewriter that I missed many details, as he spoke in a low voice, and the fact that I feared to ask him questions that would require a long answer, since it seemed to be so hard for him to control himself enough to answer intelligibly. I was beginning to sweat in sympathy with him. There’s an editor who has a real handicap to his work. But how appropriate to a “weird” mag. Not very nice to say, but it fits. Conny broke up the meeting very soon because it made him nervous. Conny is Conrad Ruppert, of Fantasy Mag, if you didn’t know. Marvel Tales seems to me to be a very nice little mag. I enjoyed three of the stories immensely, although Lovecraft seemed to me be senseless gibberish with the unobvious attempt to prove that a man can dream of his experiences after death, while he is still young, but loses them when grown up, a re-hash of the old theory that infants, being fresh from “beyond” still remembered something, and still saw things we can’t see. Otherwise the mag was good. Well, I haven’t much time, must get back to work. Answer soon and wander on a bit. Then I’ll do the same.